I think my interest in J Street could once have been called “obsessive.” I wrote numerous blog posts a few years ago, pointing out that the supposedly “pro-Israel, pro-peace” organization received financing from George Soros, mysterious billionaires in Hong Kong, and people associated with Iran, Turkey, Saudi Arabia, and the Arab-American Institute. I noted – along with then Ambassador Michael Oren – that it consistently (one could say always) took positions opposed to almost any reasonable interpretation of Israel’s interests. I objected to its guiding principle, which seemed to be that it knew what was good for Israel far better than Israelis did, especially since following its recommendations would negatively impact Israel’s security. I wondered at the close coordination between J Street and the Obama Administration, which tried to anoint it as the voice of American Jewry toward Israel. And more. WASHINGTON, DC — The pro-Israel, pro-peace group J Street launched a new series of videos today highlighting the dangerously similar rhetoric and ideology shared by President Trump and Israel’s Prime Minister Netanyahu. Released as targeted digital ads just a week before the two leaders are expected to meet in Washington, DC on the sidelines of the AIPAC conference, the videos urge pro-Israel Americans who are opposed to Trump to also speak out against Netanyahu’s similar bigotry and anti-democratic tendencies. There’s no doubt that liberal and progressive American Jews hate Trump passionately, and there’s no better way to attack Netanyahu among that group than by associating him with their bête noire. The first J Street video is here. It’s very professional and probably didn’t come cheap. 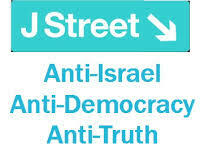 The question is, why did J Street spend a considerable sum of money on such a campaign? Americans don’t vote in Israeli elections (although J Street probably wishes they did). Why attack Netanyahu in the USA? It’s not a simple question and I don’t have a simple answer. Unfortunately, the position papers of J Street’s psychological warfare experts aren’t public. But I have some ideas. J Street’s primary goal, like that of the numerous other anti-Israel organizations in the US, including the nominally “Jewish” If Not Now and Jewish Voice for Peace, as well as explicitly antisemitic ones like If America Knew, is to create antipathy and distrust for Israel, so that Americans will oppose pro-Israel actions by the US government – for example, the recognition of Israel’s possession of the Golan Heights that is rumored to be on the table now. In the event of war, they want to prime Americans to believe Palestinian atrocity propaganda against Israel, to make it more difficult for a pro-Israel administration to support Israel, or easier for an anti-Israel one to criticize her or even cut off critical supplies – as Obama did during the 2014 Gaza war. How does attacking PM Netanyahu accomplish this? The answer has several parts. First, J Street presents Netanyahu as anti-democratic and dictatorial, as if he is entirely responsible for Israeli policy; so it becomes possible for an American Jew who still feels some loyalty to Israel to separate the country from its Prime Minister, and blame him for supposedly anti-democratic or racist policies, without being forced to make the jump to disliking Israel the nation. Second, and conversely, Netanyahu has been PM since 2009 and – at least as of today – it is likely that he will receive yet another term. He is Israel in the minds of many Americans. An attack on Netanyahu as racist and anti-minority, and in other ways that particularly resonate in America, also creates negative perceptions of the state of Israel herself. Third, attitudes in America, as expressed in the media, do have some influence on Israeli elections. There is no doubt that the forces behind J Street would like to see Netanyahu defeated in the coming election. Netanyahu’s political opponents can point to anti-Netanyahu expressions in the US and say, “look, Netanyahu has wrecked our relationship with the US.” J Street’s theme that Netanyahu and Trump are both corrupt, anti-democratic racists will find a fertile field in the progressive media such as NPR and the NY Times that are favored by J Street’s constituency. Because the campaign bashes both Trump and Netanyahu, it will certainly be amplified in those media, which are always ready to take a swipe at Trump. Fourth, closely associating Trump with Netanyahu minimizes the significance of Trump’s pro-Israel actions like moving the US Embassy to Jerusalem, cutting funds to the Palestinian Authority, downgrading the East Jerusalem consulate, and – I devoutly hope – recognizing Israel’s annexation of the Golan Heights. The politics of these two leaders is part of a broader global challenge to liberal democracies rooted in respect for civil society and tolerance of ethnic diversity. Now, the world faces a wave of rising right-wing ethnonationalism with anti-democratic tendencies. The xenophobia and authoritarianism that the two leaders are fanning is anathema to millions of Americans and American Jews. “While Netanyahu, Trump and their allies may get standing ovations at AIPAC, their views and actions couldn’t be more out of touch with most of the American Jewish community,” Ben-Ami said. This exposes the true agenda behind J Street, which is actually only one piece of a much larger enterprise opposing nationalism and ethnic particularism, favoring open borders and multiculturalism, and proudly trumpeting extreme cultural relativism. If you think that agenda is a positive one for civilization, look at the ongoing destruction of native European societies like Sweden, for example. Netanyahu – and Israel, an ethnic nation-state – represent the precise opposite of the agenda, and as such have drawn down upon themselves the wrath of J Street and other such groups, which tendentiously accuse them of being “undemocratic,” “authoritarian,” “racist,” and more. But in fact the “ethnonationalism” that J Street so decries stands opposed to a non-ethnic but much more vicious Islamofascism, which is far less democratic, more authoritarian, and viciously bigoted along religious lines. The “global challenge to liberal democracies” does not come from nationalism, either in Israel or Eastern Europe, or from Americans who support Trump. It comes from Iran, Turkey, Saudi Arabia, the Muslim Brotherhood, and so on. Netanyahu has a sense of history, and understands all this. And I think that Trump, for all his flaws, does too.